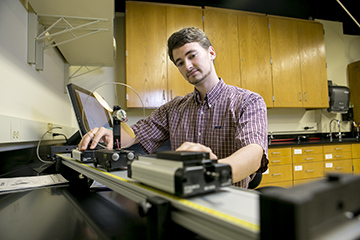 Samford University engineering physics major and University Fellows honors student Jack Kawell has been accepted to the 2016 North Carolina State University Research Experience for Undergraduates in Composites for Extreme Environments. The nine-week summer program offers rising junior and senior college students travel support, housing, meals and stipend of $4,500. Participants will work on independent projects with faculty mentors, participate in research discussions, visit industrial sites and laboratories, and present their research at the NC State Undergraduate Research Symposium in August. Kawell credited Samford biology professor Betsy Dobbins with guiding him to the NC State program. “As a University Fellow, I took her Scientific Inquiry class last semester,” Kawell said. “Her class was formative in broadening my understanding of science and its effects on the world.” The two stayed in touch, and Dobbins encouraged him to apply to summer research programs throughout the U.S. “Of all the programs I applied for, [the NC State program] was my top choice because of its applications to aerospace,” Kawell said.